This week has been a crazy one indeed. Having been sent back in time to the age of dial-up with internet connection has been trying to say the least. Not to mention the frustration of being unable to download or play the new Patch 1.3 that is live. My experience with 1.3 has only been that of my time on the PTS. So I am curious to hear how you are finding the game presently? Many of us see things in the game we wished were changed. Usually there are three groups, the ranters/whiners, the wait and see crew, and then there are the proactive diplomatic game changers. Cashogy, from the official SWTOR forums, would fit in the last group. He saw an issue and asked about it in a non-hostile, very diplomatic approach. In the section below, you can see it is leading to a change. Matt pointed me in the direction of this request, and it’s very easy for us to do! I’ve asked that it gets added to one of our upcoming patches, so keep your eyes on the patch notes! Now will this always happen…probably not, but it is always better to ask in a constructive way if we ever want our suggestions or ideas to be taken serious. To me this applies to more than just a game, but a life philosophy. Are there ideas you have for the game? What are some constructive ways you would change things in SWTOR? Let us know in the comment section below. The whole world of smart-phone apps might be lost if someone like myself who has yet to get a cell phone, but that doesn’t mean I don’t see the creativity or ingenuity of all these apps…even the crazy ones. The whole notion that if you can think up something “there is an app for that,” never ceases to amaze me. 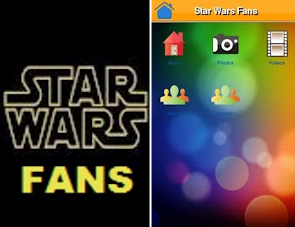 That is why when appsbar.com named “Star Wars Fans” as the app of the day for Tuesday, June 26th, I had to share it with you. The app itself allows users to find out facts like trivia or look at images and videos…pretty much anything about Star Wars Episodes I-VI. The article also mentions there are plans for several upgrades over the next few months. These upgrades will include more images, facts, videos, and basically anything that might be interesting to Star Wars fans of the movies and lore from Phantom Menace to Return of the Jedi. Be sure to look for the app on Google Play…oh and it’s FREE! If any of you have been trying to find a way to beat the heat, why not sit back with an ice cold drink and catch up on the past week’s articles at Corellian Run Radio. Those articles are listed below for your convenience. And while sitting back reading the articles please take a moment and leave your feedback for our authors. We love to hear from you. 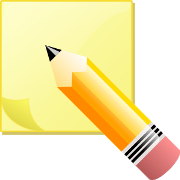 This goes out to all aspiring fan fiction writers in the SWTOR community, there is a thread on the official forums called The Writers’ Corner. The thread is to introduce fellow writers to one another, it also serves as a resource to help with writing, sharing ideas, and even help with how to build your audience. I encourage anyone into writing fan fiction or even fans of this style of writing to look into this thread. Periodically the discussion is steered by questions to generate feedback and help fellow writers in areas they might be having difficulties. How many of you enjoy fan fiction or better yet how many of you do some fan fiction writing? We would love to hear from you and what you enjoy about this type of writing. This time of the year gaming and comic book conventions are happening. So for that fan of the conventions that likes their costumes, but needs something for the cocktail party afterward you had to always find a way to change or skip one or the other function. Well those days are over! Crissy Baker has come up with two designs and currently working on others. These clothing designs have the convention going fans in mind. Below you see two of her and her sister’s designs. 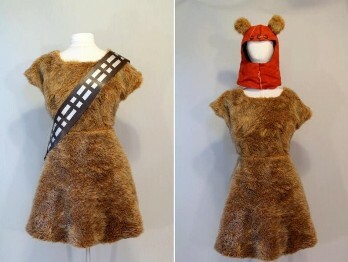 One is influenced by Chewbacca and the other is similar with the same basic dress design and fabric but accessorized with the Ewok hood rather than the Wookiee bandoleer. The Polish Republic Guild Internally Invictus has posted probably one of the best edited videos I have seen to date. I don’t say this lightly either, since beginning my writing with Corellian Run Radio, I have looked at hundred of fan created videos. There are some very good ones out there, but this guild video has a very high quality as far as editing and music. The in-game acting and camera work is pretty amazing, considering the limited tools within SWTOR for camera angles. A well done job goes out to the Polish guild Internally Invictus. Okay, enough of me talking check out the video below and you be the judge. Be sure to leave a comment below on your opinions of the video and look for more videos by this guild on their Youtube channel.